I admit that I've passed over this user assistance feature for the last few years. My reasons: it's fluff, the documentation is vague, and no one will use it. I couldn't have been more wrong. We first wired up dynamic help to our job deck editor in January. Looking at the above image you will see that the *TFSUPPRESS tag NOISEDIP has been selected with the help view offered a link for more details. It is simple, it works, and it is not annoying. The idea is to offer the user help on what has been selected in the active view or editor. The help appears in the Eclipse help view. I've put together an example plugin that shows how it works. It is a view listing three characters from the classic movie "The Good, the Bad and the Ugly". 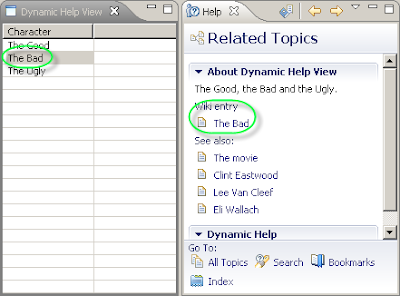 The view class is called DynamicHelpView. Download the plugin source here from SourceForge.net. The code assumes you are using Eclipse 3.3 and at least Java 5.0. I'm assuming you have some experience in adding help to your plugin. If not, spend a few minutes looking at the plugin.xml, context.xml and reference/*. * files. The Eclipse help view, if visible, will listen for view or editor activation and selection events. In our example, when it sees one of these events it calls DynamicHelpView.getAdapter(Class) with a request for an IContextProvider. To get this to work, make a selection and request dynamic help by pressing the F1 key. The ContextProvider retrieves the current table selection and returns a SelectionContext which provides the help view with help context resources to display. The help context resources can be related topics links or external links. The SelectionContext creates a list of IHelpResources. The first is a a single external link to Wikipedia followed by some internal links to related static help. The static help was registered in plugin.xml. Set a few break points in the plugin to learn how dynamic help works. There is a small bug 173073 which requires you to hit a few keys to have the help view update its list of links. It has been fixed in Eclipse 3.4 (to be released in June 2008). Don't let this bug stop you from using the dynamic help.